The Athletics announced that they’ve signed lefty Tyler Alexander to a minor league deal and invited him to Major League Spring Training. He’s been out of affiliated ball since the 2014 season, pitching on the independent circuit and in the Mexican League. Manager Bob Melvin spoke to Jane Lee of MLB.com and touted Alexander as someone who the A’s have kept an eye on for the past few years, specifically citing this winter’s strong showing in the Dominican Winter League — 2.68 ERA, 48-to-10 K/BB ratio in 50 1/3 innings — as a source of intrigue. The Orioles announced that infielder Jack Reinheimer cleared waivers and has been assigned outright to Triple-A Norfolk. He’ll be in camp as a non-roster invitee, where he’ll compete with a variety of other players for a shot at some time in the Baltimore infield mix. The light-hitting 26-year-old hasn’t seen much MLB time but bounced around the waiver wire a bit this winter, indicating that teams see him at least as a plausible big-league depth piece. Catcher Adam Moore has agreed to a minor league contract with the Rangers, tweets Jon Heyman of the MLB Network. He’d earn a $600K base salary at the Major League level. Moore, 34, has seen action in nine MLB seasons but played in double-digit games in only one of those. He spent most of 2018 at Triple-A, slashing .219/.260/.347 in 208 plate appearances. In somewhat of a blast-from-the-past move, the Blue Jays have added lefty Ryan Feierabend on a minor league deal, per Baseball Toronto’s Keegan Matheson (Twitter link). Now 33 years old, Feierabend has just 7 1/3 MLB innings under his belt since the close of the 2008 season. However, he’s had some success pitching in the Korea Baseball Organization in recent seasons and is now utilizing a knuckleball — a rare pitch in today’s game that is all the more anomalous given that Feierabend is left-handed. The Rangers have designated infielder Jack Reinheimer for assignment, as per a team press release. The move creates roster space for Asdrubal Cabrera, whose one-year deal with Texas is now official. It has already been a busy offseason for Reinheimer, who began November with the Mets but since went to both the Cubs and Rangers on waiver claims. Originally a fifth-round pick for the Mariners in the 2013 draft, Reinheimer has appeared in 23 Major League games, racking up 40 total plate appearances for the Mets and Diamondbacks in the last two seasons. The 26-year-old owns a .275/.343/.361 slash line over 2805 career PA in the minors, and has mostly lined up as a shortstop while also seeing quite a bit of time at second base and third base. This versatility could make him a claim target once more, though if he remains in the Texas organization, Reinheimer provides the Rangers with some infield depth in the minors. Nov. 22: Butler has rejected his outright assignment and will instead enter free agency, according to Gerry Fraley of SportsDay. Acquired as part of the return for Cole Hamels, Butler’s departure leaves the Rangers with just two players from the Hamels trade still under team control. Nov. 20: The Rangers announced Tuesday that they’ve claimed infielder Jack Reinheimer off waivers from the Cubs and also outrighted Eddie Butler and Ronald Herrera to Triple-A Nashville after the pair of righties cleared waivers. Reinheimer, 26, has just 40 big league plate appearances under his belt, most of which came with the Mets in 2018. He’s batted just .143/.250/.143 in the Majors but can play all over the infield. He’s spent parts of three seasons in Triple-A, hitting .278/.343/.371 in 1376 PAs — rather timid production given the hitter-friendly nature of the Pacific Coast League. Reinheimer does have a minor league option remaining, so he can give Texas some infield depth next season. Butler, 28 in March, was knocked around for a 5.62 ERA in 49 2/3 innings between the Cubs and Rangers in 2018. Texas acquired him as a secondary piece in the trade that sent Cole Hamels to Chicago, but the one-time premium prospect didn’t fare well in his limited time in the big leagues with the Rangers. Butler, the 46th overall pick by the Rockies in 2012, has a career 5.80 ERA in 263 2/3 innings. Herrera, 23, was traded from the Yankees to the Rangers one year ago to the day in a move intended to create some roster flexibility in New York with the Nov. 20 deadline to protect players from the Rule 5 Draft looming. He didn’t pitch in 2018, though, after experiencing shoulder troubles in Spring Training and ultimately requiring surgery to repair the flexor tendon in his right arm. 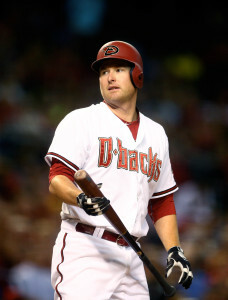 With an offense that is again struggling to score runs in Seattle and a logjam of corner outfield types in Arizona, the Diamondbacks and Mariners have agreed to a rare, significant early-June trade that will send Mark Trumbo from Arizona to Seattle, the teams announced. Left-hander Vidal Nuno is also heading to the Mariners, who will send catcher Welington Castillo, right-hander Dominic Leone and prospects Gabby Guerrero and Jack Reinheimer to the D-Backs. From the Mariners’ perspective, Trumbo will add significant power to a lineup that has struggled to score runs, as they rank 28th in the Majors with 191 runs. However, Seattle has thrived as a collective unit against left-handed pitching, which is where Trumbo does most of his damage. The 29-year-old is a lifetime .263/.311/.528 hitter against southpaws but owns a more pedestrian .242/.293/.444 line against same-handed pitching. Despite questionable OBP skills and his so-so numbers against right-handed pitching, Trumbo does figure to make the Mariners’ offense more formidable, though it may come at the cost of some defensive value. The acquisition of Trumbo also forces the team to either displace Logan Morrison at first base or utilize one of Trumbo or Nelson Cruz in the corner outfield, where both are regarded as defensive liabilities. Trumbo, who is earning $6.9MM in 2015 and is under team control through 2016 via the arbitration process. Looking at the trade from Arizona’s perspective, it’s not difficult to see why the team felt the need to move Trumbo. The signing of Yasmany Tomas this offseason gave them a pair of slow-footed corner outfielders whose most appealing asset was right-handed pop. The D-Backs have been playing Tomas at third base while highly regarded prospect Jake Lamb is on the disabled list, but Lamb is nearing a return, and Tomas’ defensive work in the infield has not been particularly strong. With this move, Tomas can shift to right field in Trumbo’s place, joining A.J. Pollock and a combination of Ender Inciarte and David Peralta in the outfield. The move also saves the D-Backs some significant money; Trumbo is owed $4.68MM for the remainder of the 2015 season, compared to Castillo’s $1.43MM, making for a total savings of about $3.25MM. Nuno has been told that he will be joining the Mariners’ rotation, the lefty himself told reporters, including MLB.com’s Steve Gilbert (Twitter link). The 27-year-old has struggled throughout his brief MLB career as a starter, but he’s pitched quite well in a long relief capacity for Arizona this season, posting a 1.88 ERA with a 19-to-5 K/BB ratio in 14 1/3 innings. Of course, that small sample consists of just three appearances, and Nuno’s larger body of work is relatively suspect. He’s tallied 196 innings at the Major League level between the Yankees and Diamondbacks, posting a 4.13 ERA with 7.2 K/9, 2.6 BB/9 and a 38.1 percent ground-ball rate. As a fly-ball pitcher, his first stint in an expansive, pitcher-friendly environment figures to benefit Nuno, but his peripheral profile doesn’t exactly indicate that he’s been the recipient of much poor luck. Metrics such as FIP (4.36), xFIP (4.15) and SIERA (3.97) all feel that Nuno’s ERA are more or less reflective of his talent level. The Mariners will hope that he can produce improved results in a more favorable setting, however, and if not, he seems like he could at least be a useful bullpen piece. Nuno has stifled opposing lefties to this point in his career, yielding just .191/.271/.317 batting line in 190 plate appearances. The Mariners will be able to control him through the 2019 season. Castillo is the most established player headed back to Arizona in the trade, and he will pair with Jarrod Saltalamacchia behind the dish to form the D-Backs’ new catching tandem. That’s a far more established duo than Tuffy Gosewisch and Jordan Pacheco, who have handled the bulk of Arizona’s catching duties this season. Arizona GM Dave Stewart stated on multiple occasions this offseason that he had no intent of adding a catcher, and he held to his word through Opening Day, but he’s since seen Gosewisch go down for the year due to a torn ACL, while a back injury has ended veteran Gerald Laird’s season. Rule 5 pickup Oscar Hernandez is on the shelf as well, creating an even larger dearth of catching options for the Diamondbacks. Arizona values prospect Peter O’Brien’s bat quite a bit, but scouts have long questioned whether or not he can handle catching from a defensive standpoint. Late in Spring Training, those questions became even more pronounced when O’Brien developed an issue throwing the ball back to the mound. He’s seen more time in the corner outfield this season at Triple-A than he has behind the plate. Therefore, Castillo and Saltalamacchia give the Diamondbacks a more experienced tandem without forcing them to try O’Brien at catcher before he is ready (if he ever is). Castillo is a career .250/.316/.392 hitter that posted a combined 105 OPS+ from 2012-13 before taking a step back in 2014. All told, his bat has been about five percent below the league average over the course of his career, which is solid offensive output from a catcher. Castillo has also caught an above-average 30 percent of attempted base stealers in his career, though like Saltalamacchia, he does not grade out well in terms of pitch-framing metrics. Castillo is under team control through the 2017 season. In Leone, the Diamondbacks will acquire a 23-year-old reliever who was dominant in his 2014 rookie campaign but has struggled to repeat that success. Leone emerged from out of nowhere in 2014 to post a 2.17 ERA with 9.5 K/9, 3.4 BB/9 and a 54.7 percent ground-ball rate in 66 1/3 innings for the Mariners. Both FIP and xFIP pegged him at 3.07, while SIERA was more bullish at 2.81. Entering the 2015 season, Leone looked like a potential long-term bullpen cog. However, he’s seen his control erode dramatically, issuing nine walks in 11 1/3 innings against just seven strikeouts. The 94.6 mph he averaged on his heater in 2014 has dropped to 93.3 mph, leading to further cause for concern. His ERA to this point is a sky-high 6.35, while ERA estimators peg him for a mark in the 5.40 to 5.80 range. Put simply, Leone is a reclamation project for the Diamondbacks, but if he can return to anything close to his 2014 output, he’d be one of the most effective pieces in Arizona’s relief corps, if not the most effective piece. Guerrero, 21, is the best prospect in the deal, despite a rough year at Double-A so far (.215/.262/.305). The nephew of famed slugger Vladimir Guerrero, Gabby has ranked among the Mariners’ Top 15 prospects in each of the past three offseasons, topping out at seventh this past winter. In their most recent scouting report, BA noted that Guerrero has plus-plus raw power, a plus-plus arm in right field (sound familiar?) and plus range as well, but he’s overly aggressive at the plate and swings too hard too often. Guerrero has baseball in his genes and is a high-risk, high-reward type of prospect; BA and other outlets such as MLB.com (where he ranks fifth among Mariners prospects) and Fangraphs (eighth) all feel that he could ultimately be an everyday right fielder, but the likelihood isn’t great without adjustments to his approach. The 22-year-old Reinheimer reached Double-A for the first time this season and has slashed .277/.323/.351 thus far. Ranked as Seattle’s No. 17 prospect by BA, he also ranks 19th per Fangraphs and 14th per MLB.com. Jonathan Mayo and Jim Callis at MLB.com call Reinheimer a singles hitter at the moment, noting that he has above-average speed and the range/arm to handle shortstop defensively. Kiley McDaniel of Fangraphs agrees for the most part and comps him to Mariners shortstop Chris Taylor, noting that there’s very little power and a utility player might be the ultimate outcome. Ken Rosenthal of FOX Sports first reported that Trumbo and Nuno had been traded to Seattle in exchange for Castillo, Leone and two prospects (Twitter links).